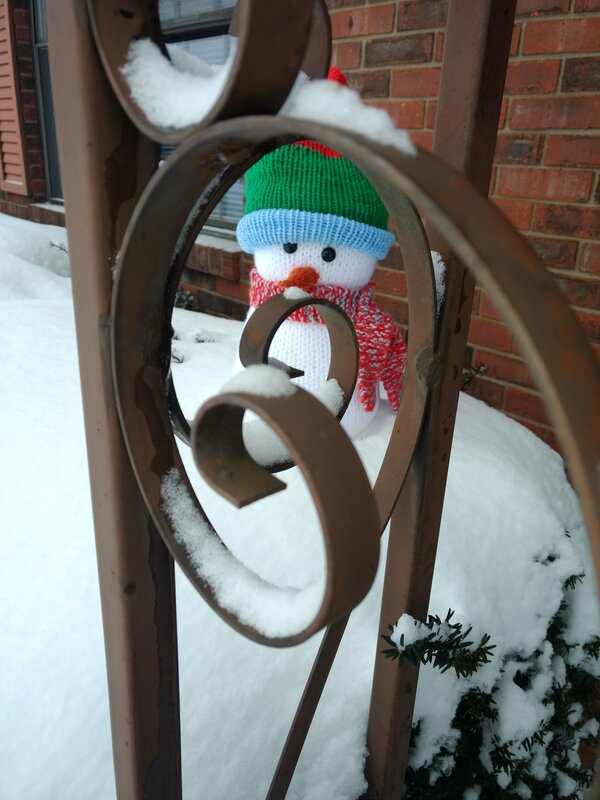 Do you wanna build a snowman…or maybe knit some hats? >> Do you wanna build a snowman…or maybe knit some hats? I almost always do a charity project of some sort for my birthday and this year I chose Linda’s Hats for Hope Initiative. When I was younger I collected lots of hand knit toys for charity and every year Linda would knit my age in donated toys. She’s sweet and generous and has helped me with so many projects so many times so this year I’m helping her by knitting my age in hats! 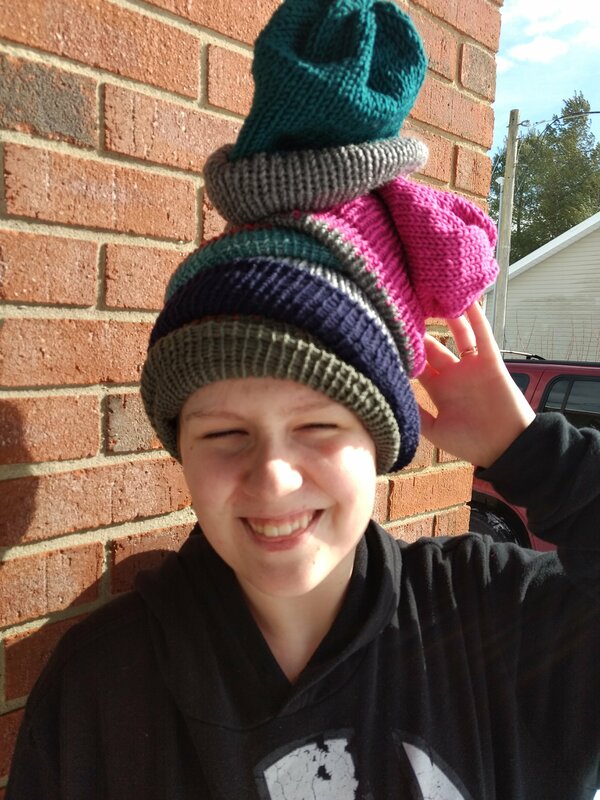 It’s only January 15th when I’m writing this (I have to turn it in early for approval and stuff) and I’m already at 15 hats and a couple of scarves… So I think I’m going to send her a few extra if I keep knitting until January 27th. Kenzie yarn makes a nice soft drapey hat and the colors are lovely too. 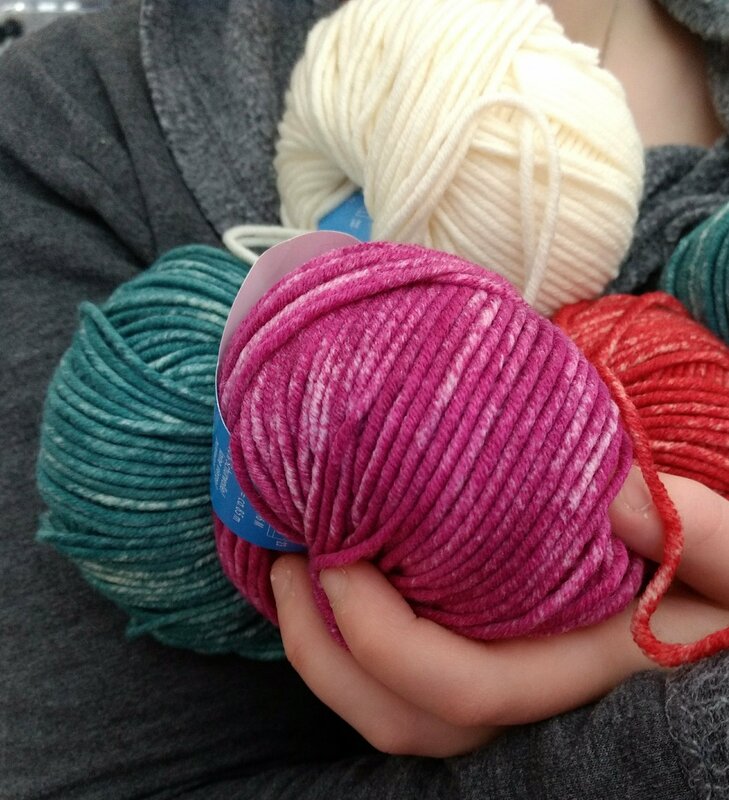 But my favorite thing is Makers’ gives you yarn when you get a knitting machine. It’s soft and squishy and two balls makes a great hat. Are you a process person or a product person? Mom is process person but I am a product person. 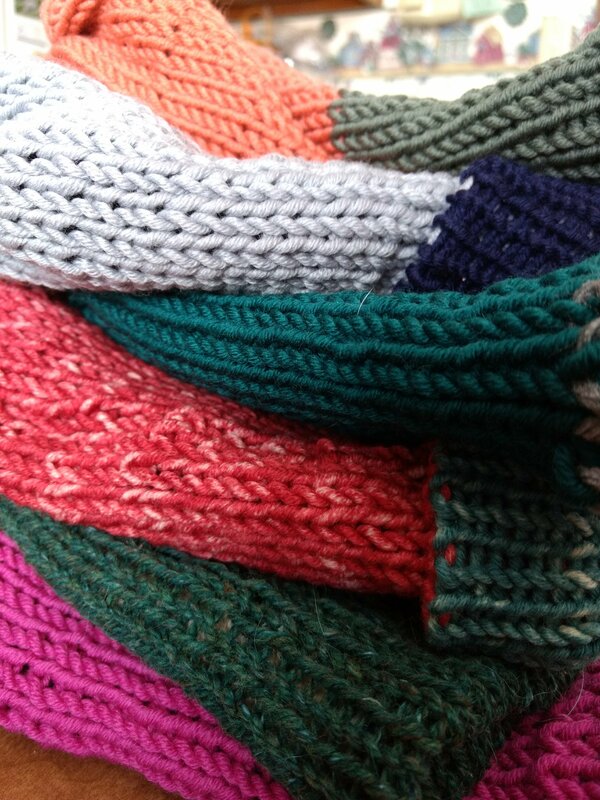 Having a knitting machine is awesome because I can make so many hats in a short amount of time. 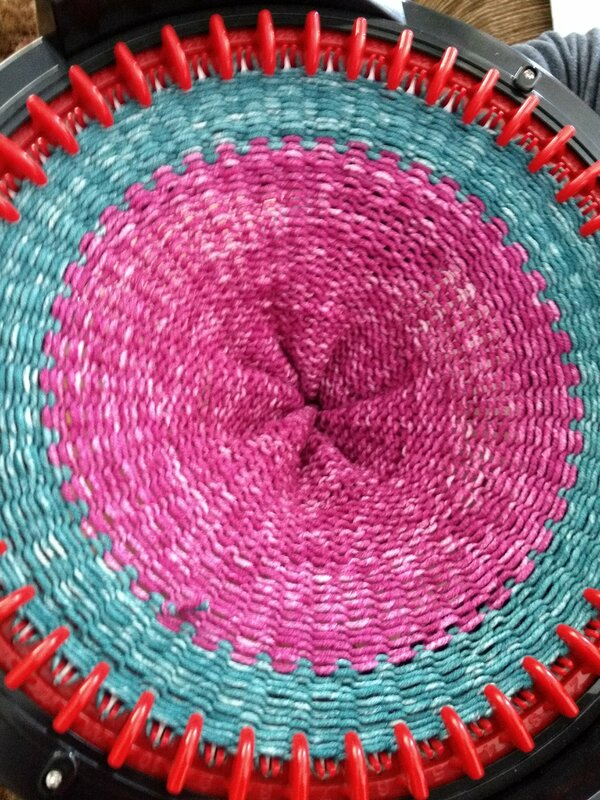 I just have to be careful not to go too fast and drop stitches. 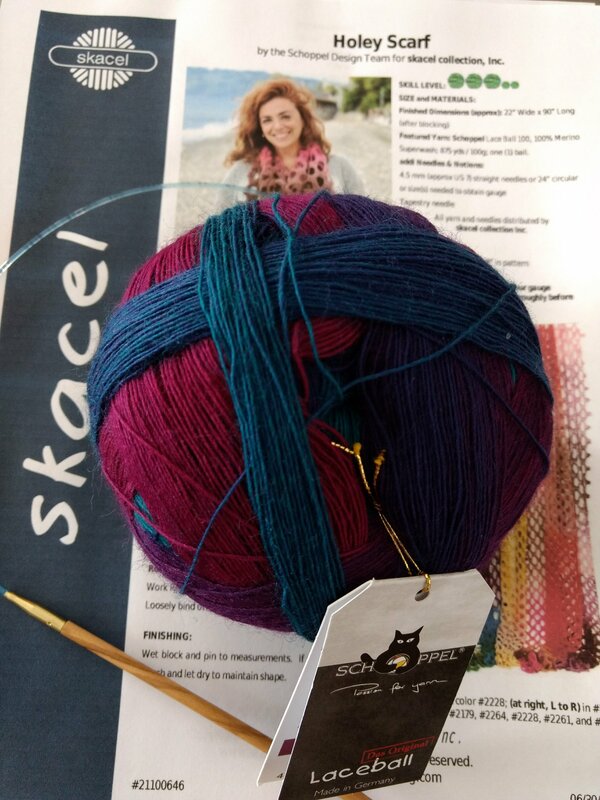 First off you need to watch the video Karin Skacel has for how to use a knitting machine. I watched the video and in an hour I had my first hat. Mom still helped with finishing, but a hat in an hour and it was so much fun to watch the knitting machine go around and around. Karin had some really important tips that helped me set the machine up successfully so that it wasn’t frustrating, like how to start and how to watch the counter. 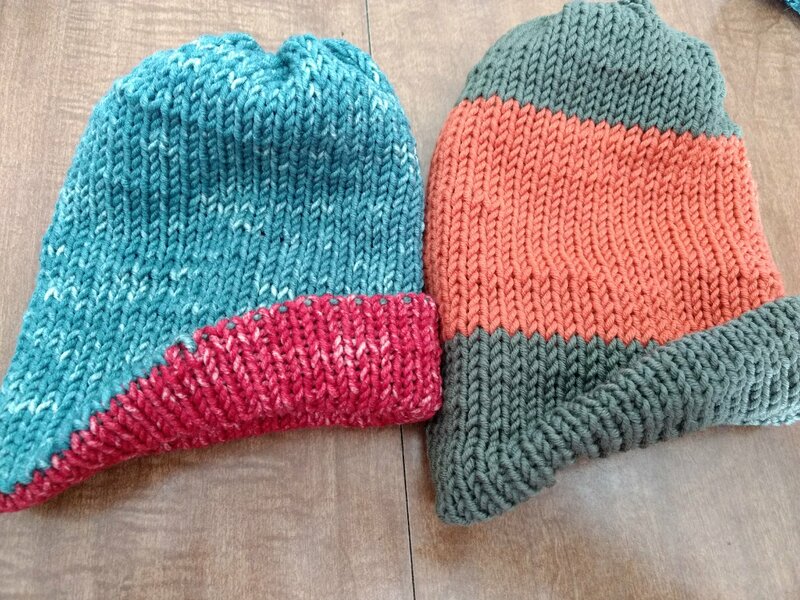 Most of my hats are two colors and reversible. 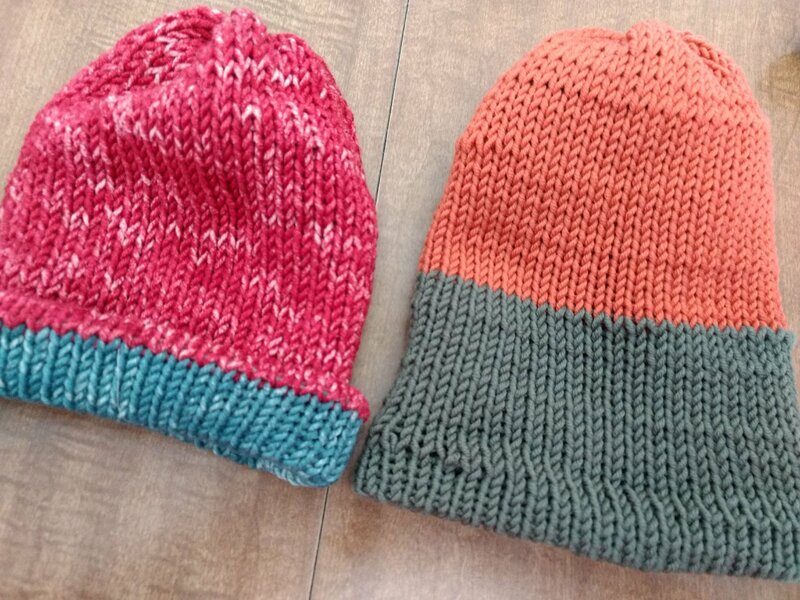 Sometimes if I have smaller amounts of yarn I add more stripes, but it is important for these hats to hold up well, so I try not to cut the yarn for no reason. I do a total of 108 rounds on a hat. So its pretty easy…just 54 rounds of each color. I can divide by 3 to get even sections of 3 stripes. I gather each end up tightly and carefully finish each end. Then I turn one end inside the other. 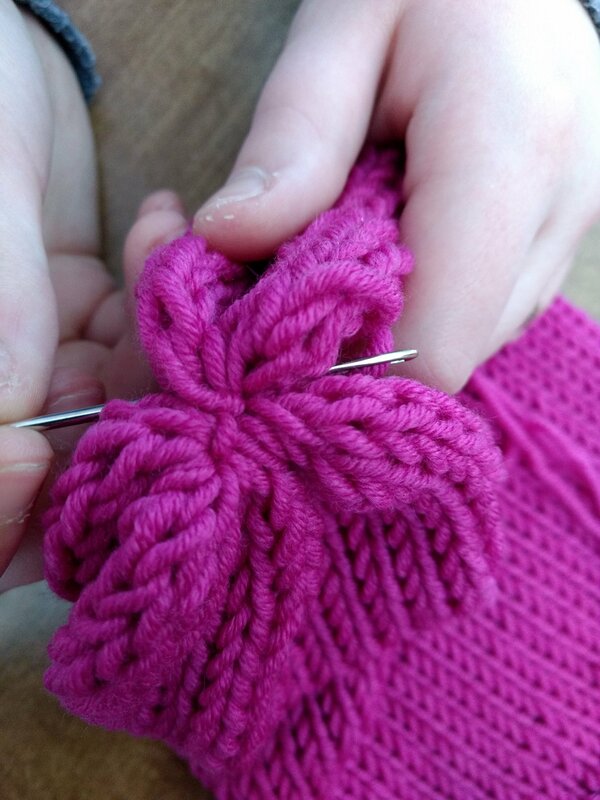 Make sure you leave a tail of yarn to join the inside so it will turn inside out without coming apart. The video I suggested has the cute topknot finish. I hear weather reports about how cold it is up north and I hope these hats keep people warm this winter and that they know people care. Next month I’m making an “unbearably” cute kit….it reminds me of a craft project my Grandmother did. I’ve been excited about making it ever since I got it and I can’t wait to show you guys. My Grandmother and Great -Grandmother were both really good at sewing, so I’m looking forward to more of that. 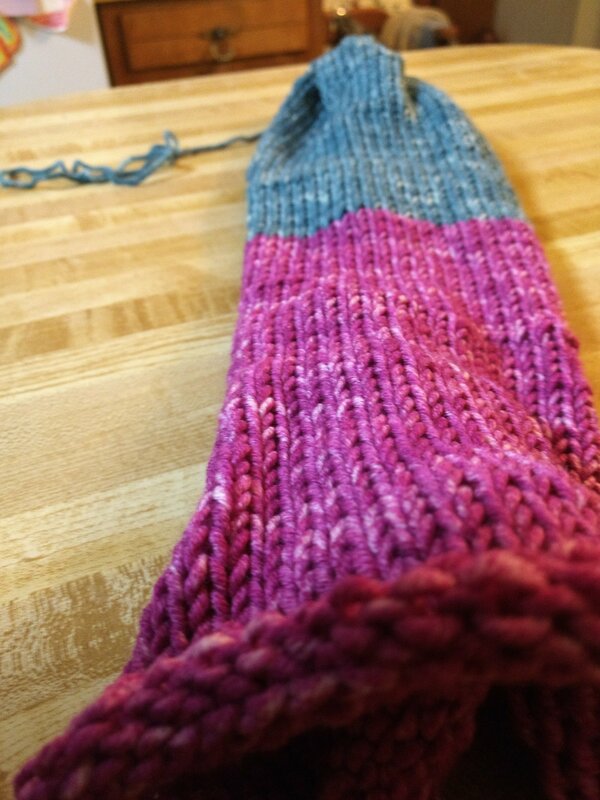 Mom is getting ready to start a knit a long over in the Makers‘ group on Ravelry…I love the scarf pattern. It’s called Holey scarf and it’s a free pattern. She’d love it if she had some friends to knit with. And then! We’ve been snowed in for two days… probably tomorrow too because it just keeps snowing…Mom said “hey! 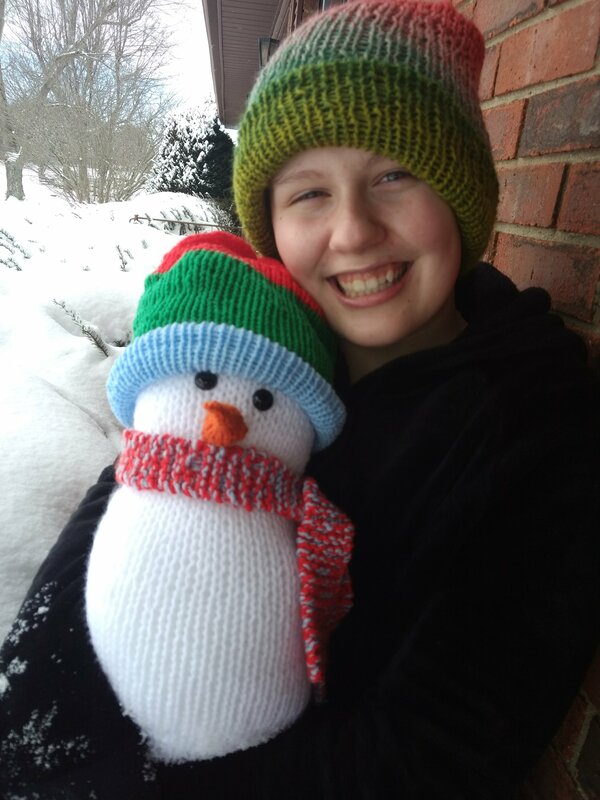 I bet we could make a snowman.” She made the nose and I did the rest….we made a knitting machine snowman! I don’t have a pattern for him yet, but we’re working on it so you can make one too! And p.s. if you want to join in the fun and get your own knitting machine, this is the one I have. I just love it! I will see you in February! Post in the comments and tell me about projects you like to do when you are snowed in. We built a real snowman that got on our news tonight! I’ll message your mom a pic in a few.